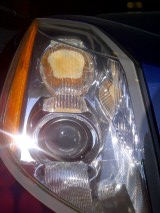 I love my Cadillac xlr except for my melting headlights. I am so angry with general motors and will share with you my story. I first noticed the problem in the fall of 2010. I contacted my dealer who said there is no recall on the problem so their hands were tied. they were just small spots so I lived with it. car had 33,000 kms. I only drive the car occasionally and store it in the winter. I put an average of 8,000-10,000kms per year. I contacted dealer in 2012 and again was told sorry no recall. In 2014 I went back to my dealer (Williamson Cadillac in Uxbridge, Ontario) and met with service manager. I printed off the pages of complaints on the internet. 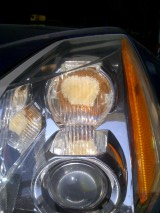 I The car is the most expensive Cadillac ever made and with 80,000kms my lights are burnt out. My wife had a 1989 sunbird with 200,000 kms on it and headlights were still perfect. The dealer said their hands were tied and referred me to the regional sales manager. the regional manager would not meet me but told my service manager no, the car is too old. i said if there was no problem why did gm add a voltage regulator to headlight assembly in 2005 and all new headlights come with the voltage regulator. I then wrote a letter to Kevin Williams president of GM Canada. He did not reply but one of his so called assistants called me. Mr. Williams is a very busy man. I explained the ongoing problem with the headlights as well as shared all the buzz on the internet about this wide spread problem. He just kept saying the same thing. Car is too old. I explained that i identified the problem in 2010 with only 33,000 kms. and gentleman again said car was too old then too. I said i spent a lot of money for this car and it is mint, babied, stored indoors. He said sorry car is too old. I then said i have been a loyal gm customer for 30 years and this will effect my future buying decision and it will be the last gm product i or my family will buy. The gentleman said that's fine if that is how you feel. The car is too old. As of today I refuse to pay $3,200.00 for new headlight assemblies that were knowingly and incorrectly made by gm In 2005 GM corrected the problem by adding the voltage regulator to the light assembly and have given 2004 Cadillac xlr owners the runaround ever since. Kevin E.